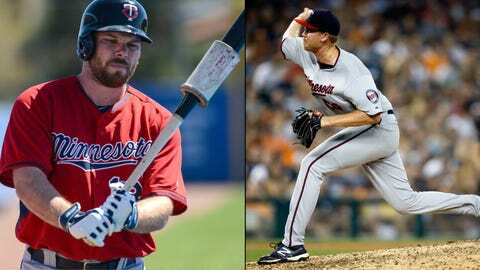 Veteran Jason Kubel (left) is trying to make the Twins as a backup outfielder and designated hitter, while brother-in-law Michael Tonkin is hoping to lock down a spot in the bullpen. FORT MYERS, Fla. — There were plenty of new faces in the Hammond Stadium clubhouse when outfielder Jason Kubel reported to camp in mid-February. Of course, there were some he recognized from the decade he spent with the Twins’ organization, but much had changed since he last played for Minnesota in 2011. Then there was a teammate Kubel knew very well, but had not yet played with on the same team. That would be reliever Michael Tonkin — Kubel’s brother-in-law. Kubel’s wife, Blake, is Tonkin’s sister. Their families live about an hour away in California in the offseason, so Kubel and Tonkin see each other a few times a week. Now they’re reunited in Fort Myers as two roommates and teammates trying to break camp with the Twins and carry their family bond north to Minnesota. "It’s cool to be able to have basically my brother here," said the 24-year-old Tonkin. "We live together right now. It’s cool to have him as a roommate and then have him in the same clubhouse, too. It’s pretty exciting." Kubel left Minnesota via free agency after the 2011 season and spent the last two years with the Arizona Diamondbacks (and Cleveland for a month at the end of 2013). When the 31-year-old Kubel was looking for a place to play in 2014, Minnesota seemed to make sense. 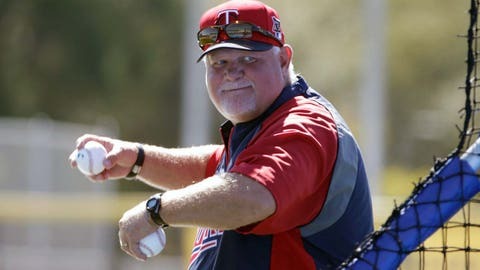 It was an organization he was very familiar with, and had a manager in Ron Gardenhire that he loved playing for. So the Twins signed Kubel to a minor-league contract, with an invitation to spring training. It didn’t hurt that Kubel now had a family tie to the Twins. Tonkin, a hard-throwing 30th-round draft pick by Minnesota in 2008, made his major-league debut this past season as a reliever. Kubel was able to watch Tonkin’s July 11 debut from Arizona. When Kubel was traded to the Indians at the end of August, he and Tonkin were able to catch up in Minneapolis when Cleveland came to town. Tonkin pitched in two games that series but didn’t get to face his brother-in-law. Kubel and Tonkin are hoping that they won’t ever have to face each other. They’d prefer to be wearing the same uniform on Opening Day. "We’ve talked about it," Kubel said of playing with Tonkin. "It’s obviously something I wanted to do for a lot of reasons. We’re both happy that it’s working out this way so far." Neither player has a guaranteed spot on the 25-man roster. The 31-year-old Kubel will need to prove this spring that he can not only stay healthy — he played in just 97 total games last year — but that he can still produce at a level that at least resembles what he did during his first stint in Minnesota. So far this spring, however, Kubel has struggled to find his groove at the plate. He’s just 1-for-14 with seven strikeouts through Monday. Tonkin, meanwhile, has just a few outings of big league experience to fall back on. His debut in July was brief as he was shortly sent back to Triple-A Rochester. Minnesota then called him back up for one game in August before bringing him back for good as a September call-up. But Tonkin impressed in his limited time in the majors: 10 strikeouts and just one earned run in 11 1/3 innings of work. So far this spring, Tonkin has picked up four strikeouts and has allowed only one baserunner — via a walk — in four innings (13 batters faced). While Minnesota’s bullpen returns almost entirely intact from a 2013 season in which the relief corps was the Twins’ strength, Tonkin hopes there’s a spot for him in that pen in 2014. "It’s kind of out of my hands. I’m just trying to perform. I don’t get to make those decisions. I get to just hopefully perform. That’s all I can do," Tonkin said. "I’ll do whatever they need me to do to help the team. I’ll be happy with whatever I’m given." And Tonkin also hopes the Twins can find a spot for his brother-in-law. Minnesota has a competition brewing for its corner outfield spots, as well as designated hitter. While Aaron Hicks, Alex Presley and Darin Mastroianni are all battling for the center-field job, guys like Kubel, Wilkin Ramirez and Chris Parmelee are hoping to land a spot as a corner outfielder. The left-handed Kubel could also be used as a designated hitter — he has more career at-bats as a DH than as a right fielder, and only 115 more at-bats in left field than at DH. There’s no question that everyone in the Kubel/Tonkin family will be keeping a close eye on how things unfold in Fort Myers. If either player does head north with the Twins, the hope is that the other will make the trip as well. "That would be pretty exciting," Tonkin said. "That’d be a dream come true, but who knows."